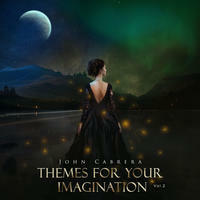 John Cabrera : Themes For Your Imagination - vol 2. Lush, deeply moving, cinematic soundscapes and soaring musical themes for your daily eargasm. Vol.2 continues from where Vol.1 left off. With more deeply moving and melancholy themes and textures. Featuring various choirs and solo singers, blending Spanish, Italian, and European sounds. A pure melting pot of sound and emotion. Your imagination is the only limit! License Lush, deeply moving, cinematic soundscapes and soaring musical themes for your daily eargasm by John Cabrera for your project. Play the music of John Cabrera in your restaurant or store.